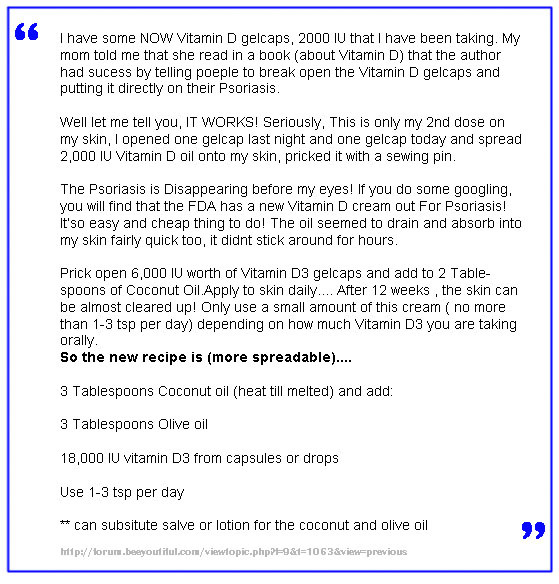 Vitamin D psoriasis treatment - It actually helps! →Vitamin D psoriasis treatment – embrace the sun, it won’t kill you! Vitamin D psoriasis treatment – embrace the sun, it won’t kill you! I feel so stupid for not exploring the health benefits on my psoriasis by taking a Vitamin D3 supplement during the winter months until recently. It was pretty obvious that my psoriasis gets worse in the winter and better in the summer as I am sure is the case with 90% of the readers here. Not only that but I would suffer depression (or SAD which is the medical term) during the winter months and was never sure why that was. Psoriasis sufferers and people with other auto immune disorders are known to suffer from very low levels of Vitamin D. Therefore it makes sense that by adding this supplement to your diet, you will be more or less guaranteed to see at least some improvement in your skin condition, and also your mood. Please click here to read my recently updated ultimate guide on how to use vitamin d to treat your psoriasis. Skin production of vitamin D from exposure to the sun improves the condition of psoriasis — which we know is an autoimmune skin disease that consists of red, scaly patches that have a silvery-white appearance. Vitamin D is known to reduce adaptive immunity (T Cells) therefore reduce the overproduction of skin cells. it is this vitamin that we get from the sun so it makes sense to substitute like for like when the sun is not around in winter. You can overdose on vitamin D and can affect your blood pressure, cause muscle weakness, and lead to gastrointestinal problems. 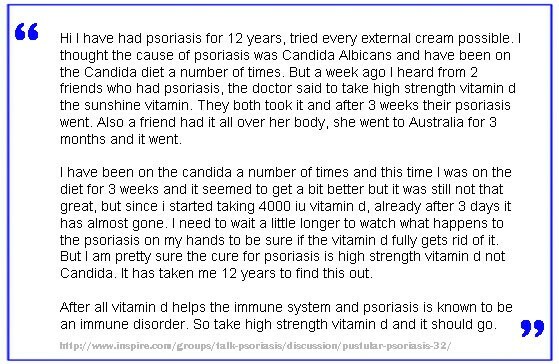 However I have read on many forums that some people take up to 10,000 iu per day to help their psoriasis. I personally take a 6000 iu per day to no ill effects but as everyone is different please consult a medical professional before starting a supplementary course. I have read so many positive comments about using vitamin D3 for treating your psoriasis. I have even met random people in real life who swear by it to help their psoriasis. So without further ado, here is the first of many favourable comments I have found on the internet. Here you will see another great comment and also some suggestion for daily intake amounts. Also note that having a good diet is essential as well. The reoccurring theme is good diet plus vitamin D3 supplements. Having a well balanced diet means you have all the necessary building blocks in your body to help improve your psoriasis but you are missing the final piece to solve the psoriasis puzzle and this piece is Vitamin D3. I love the following comment and she followed up with another comment on how to make your own topical Vitamin D3 ointment/cream. I combined both quotes below into one. 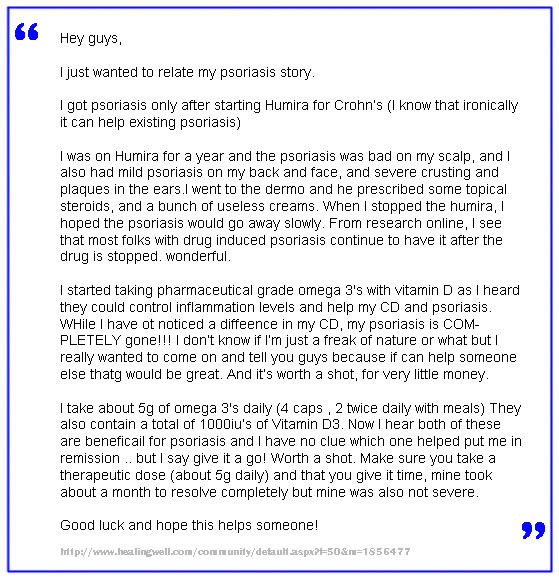 Here are two comments on a medical blog post I found that gave me more belief in the power of Vitamin D for psoriasis. I will be honest. 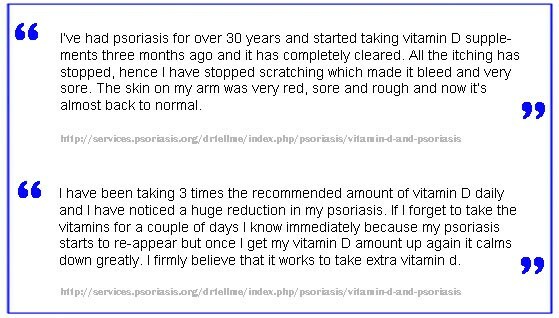 there are not too many negative comments for Vitamin D3 and psoriasis The following one actually saw improvement but not too much improvement. Its good to see that a Doctor had the common sense to think outside the box and advise an alternative treatment for psoriasis. Due to the high ratio of positive comments to negative comments I found, I will have to give a score of 8/10 for effectiveness. This looks like a must have supplement for every psoriasis sufferer in the World. On a personal note, I also have started to add vitamin d3 to my daily routine and within 2 weeks I noticed a stubborn spot on my hair line disappear. Results range from 2 weeks to 3 months. One thing to notice is that having a good diet to start should mean you will see results faster. Before you rush off and buy shares in Vitamin D3, it has to be noted that people see improvements in their psoriasis when you try to improve their overall immune system and not just your vitamin D levels. So if after reading the above success stories you decide to try Vitamin D3 supplements as a form of natural psoriasis treatment then also consider ditching all the junk food. Start living a healthier lifestyle filled with organic foods and vegetables along with some good all round multi vitamins . If you want to know more about the best diet for psoriasis then check out my free ebook which explains in a step by step manner how I control my psoriasis through diet. If you are serious about getting your psoriasis under control and would like to cook psoriasis-friendly meals but lacking ideas, check out my Smart Psoriasis Diet 30 Minute Meals recipe book.